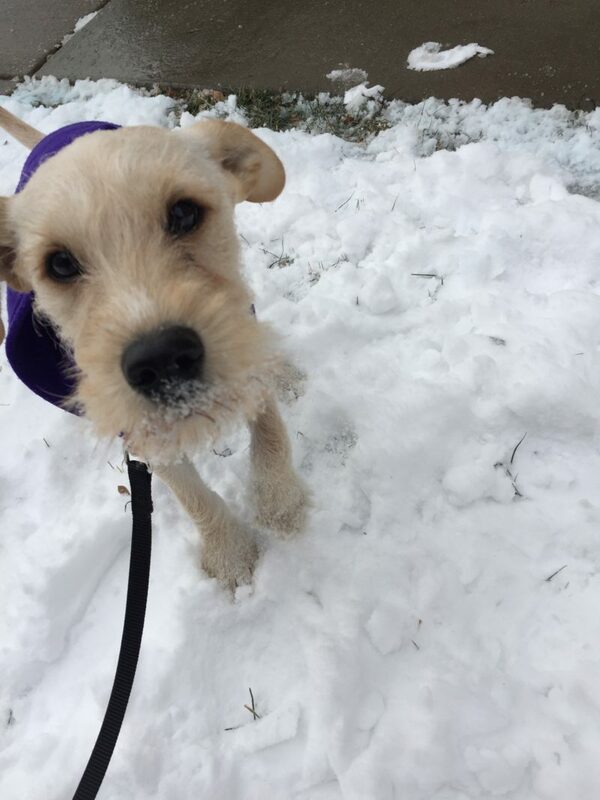 ISO Shaggy Dog: Part Six: Chewing, Cats and SNOW!! I had written the post below for today. However, given the weather we woke up to, of course I have to begin with a little commentary on Archie and Daisy’s first experience in the snow. For dog owners, that white stuff is not only messy, but it’s also extremely challenging when it comes to a dog’s bathroom habits. Because the snow is blanketing the grass, dogs can’t smell those good scents that beckon them to potty. Compound that with puppies who haven’t quite developed good habits yet, and you have accidents (and owner frustration) waiting to happen. Since we’ve gotten them home, Archie and Daisy have played with each other endlessly. In fact, that’s pretty much all they’ve done outside of sleeping (lots and lots of sleeping, thank goodness! ), eating and that other very time-consuming activity that follows eating. Because they’ve kept each other entertained so well, we felt good about our decision to bring home two. However, two also means whatever trouble one gets into, the other won’t be far behind. Chewing computer cords and the wood trim on my grandmother’s sofa, trying to eat mulch and jumping on my desk chair and then onto my desk (thankfully, only Archie has mastered this one!) are but a few of their many puppy tricks! The floor is absolutely littered with Nylabones, Kongs, Christmas-themed toys and other things that are appropriate for doggies to chew on, but somehow something like my nail file or the zipper on their dog bed is oh so much more fun! Kind of like babies who pull the pots and pans out of the cabinet when they have a whole roomful of toys. As soon as I’m certain that I have absolutely everything out of their reach, they find something new to get into. Slowly but surely, everything in my office within puppy reach, including their bed (sorry, guys! ), has been moved to my office closet. The up side is it’s forced me to organize my closet … and my office is a whole lot less cluttered now! When we were looking for a dog to adopt, one of our chief concerns was how that dog would interact with our 4-year-old tabby cat, Sammy, who we adopted in 2014 after losing three animals in the space of two months. While Sammy definitely helped us move past our grief, our 11-year-old dog, Ava, was never all that keen on him. Because Ava was getting a little deaf and blind by that point, this teenager and all his darting around just annoyed her. She’d rouse from her nap when he ran by, bark at him and then promptly go back to sleep. Sammy, on the other hand, seemed to want her to like him, occasionally even curling up on her bed beside her. She didn’t object because quite honestly, she probably didn’t know he was there. From the get-go, the puppies have seemed curious about Sammy, and Sammy has seemed tolerant of them. A couple times a day, Sammy will bump his head against the closed door to get in. If Daisy and Archie are sleeping, Sammy will slink in and head for his kitty condo. If the puppies are awake, he’ll peer in to check out the situation, sometimes hightailing it for his condo where he’ll watch their puppy antics from the safety of his perch (Daisy seems to like to show off her toys to him). In any event, everyone is playing nicely, and we think they will coexist as peacefully as dogs and cats ever do! Keep your eye on this page for the next installment of ISO Shaggy Dog.